At Joyful Mountain, we believe that great products are produced by great ingredients and people who care. That's why we only use high quality ingredients in our products! In fact, the reason we started making our own soaps, balms, and oils was to ensure quality and save money. Why pay a premium price for a Name-Brand product when we have the knowledge and skills to make a premium product and save? At Joyful Mountain, we've been using essential oils for about 13 years, and have been blending our own high-quality oils for about 10 years. We've done extensive research and continue to study and learn daily as more scientific studies give us new insight; and, as a safe-guard , we consult with a food scientist, nutritionist, and dietitian on a regular basis. What drives us is the health of our own family (we are a young family of eight), and the promise that we're bringing you only the best. We want our friends and family to have wonderful products that they can trust -- and that don't break the bank. Our products are for people who don't need to have a high-dollar Name-Brand to make them feel right. People frequently ask us how we can supply high-quality oils for such a low price - in fact, for less than 1/2 the cost of other Name-Brand companies. They think it must be a scam. It's not. We don't have hundreds of employees or up-lines to pay (how do you think they pay for those "free oils" every month?). We don't expense cruises or yearly conventions. Our website is pretty plain, and we don't hire professional photographers or an answering service. We do it all ourselves. That's how we save everyone a lot of money. That's the way small businesses should work; and that's why shopping small and local is so much better for everyone. As far as the quality of the oils -- For every oil that we sell, we have a Certificate of Analysis that gives us detailed quality information about the oils. That means we know the properties of the oils, how they're produced, and how medicinal they are, just like the big Name-Brand companies. We get our oils from many of the same distributors that produce for the Name-Brand companies. Let's just say that we know what happens to the oils from the time they're seeds to the time they're plants, and then turned into oils and sealed in bottles, just like the big companies. People sometimes ask if we produce our own oils. Not yet (that's the short answer). But no other company, that we're aware of, produces all of its oils, either...although their advertising gimmicks pose a pretty good front. Making soap and balms came naturally for us, as we're farmers and gardeners. We grow the loofahs, milk the sheep, use local honey and beeswax. Sometimes we want a pure, simple soap and that's what we have in our Castile and Stain-Out soaps. We've never seen a soap that removes stains as well as our Stain-Out bar! We love sheep-milk and charcoal soaps for gentle cleansing of faces and bodies. All of the products start as whole ingredients, which ensures a luxurious and wholesome product every time. We appreciate you and thank you for your business. We'd also love to hear from you or meet you in person sometime! Let us know what you think and give us ideas for new products. Blessings to you all. Phineas was born October 12. A few years ago, in January of 2015, I posted a video (actually, it's chopped into 3 sections) of a class I did on the use of Essential Oils during pregnancy and on children. I recently updated that information and am re-posting the paperwork. I did a lot of research for this class -- several weeks were spent reading and gathering information, not to mention the years I spent using oils on my own family so that I had personal experience and knowledge regarding the use of the oils on little people. Please remember that Essential Oils are neither CANDY nor TOYS and that they should be treated as if they are medicines. They are potent! A drop goes a long way, and I always use a carrier oil when applying oils to my children. Also, I didn't produce this cheat sheet as an academic work. I have not saved or posted any of the articles I read or the places where I received my information. Much of it can most likely be supported by searching online. This is simply for your use in your home, to make life easier for you and help you better understand what oils to use and when. Be blessed! A couple of years ago a friend called me at 10:00 p.m. the day before Thanksgiving with questions regarding what to do with her young child's broken leg. It was itchy, hot, painful, and the child was not happy! Of course, the only medical facility that would be available for the next two days was the ER. That's the way it seems to always go! Two weeks ago, we were working in the backyard when my son fell and broke his arm. It was one of those surreal moments. Your mouth goes dry, your palms sweat, and you struggle to retain a sane thought. My poor husband, distressed by the sight of the crooked arm, which looked like clay or putty shaped into a squiggle line, couldn't decide what to do. Do we call 911? Do we try to move it? Realizing that this was beyond him, he called a paramedic friend who told us to take him to the ER to have the bone reset. In the meantime, I was calling out orders: "Get ice ...no, get the bag of peas from the freezer!" Peas would mold to the crookedness of the arm. Externally, I was telling my child that it was going to be okay and trying to calm him down, but internally I was screaming, "What pain medication do I use?!? I don't know what to do! Oh, that looks BAD. Gross. Oh man, we have to go to the hospital! Ok, focus and help your son get through this...and your husband." I found myself flying to my oils drawer and searching out Pain Out. I placed about an ounce of water in a small cup and two drops of Pain Out in it and ran to my son, who was still sprawled out in the yard. By the time I reached him, I had spilled some of the oils and water, so he probably only got about 1/2 of the oil. I had him drink it and then he, my daughter, and my husband were off to the hospital. The rest of us met them there later. I have read several accounts of how to use oils for broken bones and when it came down to it, I used the one oil I would have immediately recommended in that instance...Pain Out. The founder of Young Living, Gary Young concocted something very similar to Pain Out (which Young Living sells as PanAway) when he broke his leg. Other good oils in this instance would be Extinguish, lavender, or copaiba directly on the arm. 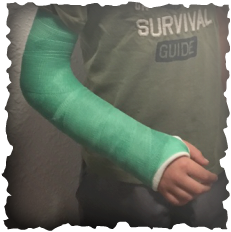 When my son came home in his splint, he took Pain Out one more time, but that was all the pain medication he required, outside what they gave him in the hospital when they reset his bone...which was some horribly strong drug. We used copaiba on his hand and fingers two or three times a day over the next few days, while the arm was still swollen. Then he got the cast. He still has the cast, and will for several weeks. When he complains of the cast itching, I rub bottom balm onto his arm, around the edge of the cast (usually, it itches right inside the top of the cast), then I rub a drop of peppermint on his fingers and hand. A small ice pack (boo boo buddy) sits in his hand, an ice pack sits on his cast, and an ice pack frozen in a "c" shape curves around his arm at the top of the cast. Then, we cover his entire arm with a towel to seal in the cold. He sits and reads a book. Within a few minutes he is feeling better. Hopefully, within a few weeks, this will all be history, and hopefully this will help someone else who has to endure a cast for several weeks. I've also heard that comfrey is excellent for healing broken bones...but I don't know much about that. It's a goal of mine to delve into herbs this coming year. Hi there! I want to tell you about a new blend that I’ve been concocting. One of my children is a pre-teen who is beginning to see occasional breakouts. Having been there once, I know that this is one of the down sides of growing up. Oftentimes, when I get a few blemishes, I’ll just put a touch of lavender oil or tea tree oil on it and it goes away; however, at times, I find the neat oils to be too powerful and they irritate the skin, instead. There are other oils, too, that are suitable for curing irritated skin, and at times, plain coconut oil is the remedy that we need. Using a 10 ml roll-on bottle (which we sell in the "empty bottles" section of the store), I placed fractionated coconut oil (which we sell in the “single oils” section of our store) into the bottom ¼ of the bottle. Then, I filled the bottle to the top with fractionated coconut oil and voila! The blend is SUPER inexpensive and it works amazingly well. I hope this helps you, too. Be blessed. This Biochemist turned stay-at-home-mom did a pretty cool experiment on cleaning products, including Thieves spray, Thieves cleaner, and essential oils in hydrogen peroxide. Click here to find out why I'm changing my cleaning routine! Vitamin E - What's the Difference? This article stems from an error I made several months ago when I was formulating our lotion bars. I purchased what was labeled as "natural" vitamin E that was "pure enough to take orally." When I began looking at the label's fine print, though, I realized it was a synthetic vitamin E concoction that was produced using corn and soy oils. Yuck. I did a little bit more research and then purchased a new vitamin E oil -- pure, natural 100% vitamin E.
Human bodies need vitamins in order to maintain health, and most people don't get the proper amounts of them through their diets. Many of us turn to supplements to fill in the gaps. However, the form of vitamins you take may play an important role in how well your body absorbs them, and getting the right form might mean the difference between better health and wasted funds. Some synthetic vitamins are easily flushed out by the body because of their water solubility. In fact, when you take some synthetic vitamins, you may notice that your urine turns a bright yellow color, particularly with Vitamin B12. That’s just the excess vitamins your body couldn’t use going down the drain. While the body is flushing out the excess, the kidneys are being taxed to remove that excess; and, some synthetic vitamins are made up of ingredients that have a low bio-availability, which means that your body is unable ﻿﻿to utilize most of the nutrients. Therefore, most of your money is *ahem* flushed down the toilet. Along with water-solubl﻿﻿﻿﻿e vitamins, fat-soluble vitamins such as vitamin A, D, E, and K can be chemically altered with synthetic ingredients in a laboratory, resulting in "pure" synthetic vitamins. And, because they are dissolved in fat instead of water, if you take more of these fat-soluble vitamins than your body can metabolize, they will be stored up within your fat cells, resulting in toxicity and creating even more health problems for you! Since some synthetic vitamins are made up of chemicals, including nicotine and coal tars, allergic reactions are also more likely. Vitamin E is an important fat-soluble vitamin whose most important role is to act as an antioxidant (it reduces the damage caused by free radicals). Vitamin E also helps keep the immune system strong and aids the body in properly using vitamin K, helping maintain normal blood viscosity. Some good sources of vitamin E are wheat germ, almonds, and sunflower seeds. The maximum allowable dose for vitamin E is 1000 IU/day for the synthetic form and 1500 IU/day for natural sources. So what’s the difference between the synthetic and natural vitamin E? Vitamin E exists in eight different forms (alpha-, beta-, gamma-, and delta-tocopherols and tocotrienols) each of which has slightly different activity in the body. Even though there are 8 forms of vitamin E, the most biologically active form of the vitamin is called alpha-tocopherol. Alpha-tocopherol is considered the active form because it is the preferred form of vitamin E transported and used by the liver. Synthetic vitamin E does not come from a natural food source and is generally derived from petroleum products. Labeled as dl-alpha-tocopherol or any variation starting with dl-, it is found in most singular vitamin E supplements. Most multivitamins contain a semi-synthetic vitamin E extracted from plant oils. It is GRAS to consume synthetic or semi-synthetic vitamin E, but you may not be getting as much of the vitamin into your system as you are intending. Synthetic vitamin E, due to its chemical structure, is only about 12% as potent as natural vitamin E. It is also not as bio-available (meaning easily used by the body) as its natural counterpart, decreasing overall absorption and utilization of the vitamin. Synthetic vitamin E is also excreted faster than the natural form, so it doesn’t have as much time to get into the tissues where it is needed. Natural vitamin E is labeled d-alpha tocopherol, d-alpha tocopheryl acetate, or d-alpha tocopheryl succinate or sometimes appear as mixed tocopherols. Natural vitamin E comes from plant oils instead of petroleum and is better absorbed by the body. Specific transport proteins in the liver tend to bind better to natural vitamin E, allowing it to be transported to other tissues in the body. At Joyful Mountain, we believe it’s important for us to research our ingredients so that you don't have to! Rest assured; we only purchase natural forms of vitamin E for use in our lotion bars and lip balms. ﻿I want to tell you a little bit about three of our Essential Oil Blends that people often misunderstand. Bug Out was formulated when I began to see a naturopathic doctor a few years ago. As she read my test results, she called out several pesticides that were in my system and asked if I used a bug spraying company at my house. Yes, I did, and the test results were showing it! I had been absorbing the chemicals and they were wreaking havoc on my system. I wondered, "If it's affecting me this much, and I don't roll around on the floor...how much is it affecting my children to spray our baseboards and doorways?" I began to do a little bit of research regarding bugs and found that there were some essential oils that are particularly good at repelling bugs. The Bug Out blend trial began. Since then, I've been using Bug Out regularly as a baseboard spray in my home, and weekly in my mop bucket with vinegar and a squirt of natural dish soap. When I use Bug Out in my mop bucket, I see very few bugs. I might see a spider on occasion or a camel cricket. I spray the baseboards a couple of times in the spring time, as the bugs re-appear, and then a few months later in mid-summer. Again, in the fall, I'll spray a couple of times as the bugs try to find their winter home. During the winter, I rarely, if ever, spray the baseboards. Unfortunately, I haven't found an oil that repels flies well enough to keep them away (though diffusing will keep them away short-term). If I find one, I'll let you know! In the mean time, Bug Out is a great way to relieve yourself of unwanted pests along with unwanted chemicals and bug spraying company bills. We're saving roughly $400 a year by being healthier and the oils are working great! The original Cleanse blend was formulated as a sort of copy-cat version of Purification, by Young Living. I had discovered that Purification worked great on my family for repelling insects in the wild, and it was great for pulling out wasp/bee stings, and for killing bacteria. Over time, the blend changed as my preferences did, and we ended up with the oil we carry now. It's clean, refreshing, and it kills bacteria and mold. I've used it to pull snake venom out of my dog's face (and she's still alive, 5 years later!). It works great for repelling mosquito, chiggers, and ticks around our house. (Peppermint also repels chiggers, if dropped onto a cotton ball and rubbed across the chigger-prone areas of the body, but use caution because it might burn.) Purity destroys stinky smells, too. Once, someone smoked in my car a LOT while they were borrowing it. I couldn't get the smell out for anything. Eventually, I put 6 drops of Purity on a wash cloth and hung it from the rear-view mirror for a couple of days. When I got into the car, I couldn't believe it -- the smell was completely gone, and was replaced with the wonderful scent of Purity oil! This blend was formulated with burns, cuts, and scars in mind. I first created it because we seem to always have a toddler in the house who falls a lot while learning to walk, climb, etc. I needed something that reduces inflammation, cleanses the skin, and soothes upset babies. This was the answer! Because it has so much beta caryophyllene, Copaiba is said to be the most powerful anti-inflammatory oil available today; and, it is safe for even the smallest person to use. Tea Tree oil is exceptionally good for the skin, and it's anti-bacterial. Lavender is anti-bacterial, soothing to skin, and calming. The three together make a powerful, effective, and safe oil for everyone in my family. I've been using Extinguish for a long time on scars, bruises, inflamed cuts, and burns. Once, I put my hand into the oven while it was wet and accidentally touched the rack (I know...duh). It peeled my skin back immediately, leaving a nasty open wound. For three days, I put Extinguish on the spot, and it healed quickly, neatly, and painlessly! Extinguish works quickly and amazingly effectively when our little guy falls and bumps his head. If we put the oil on, generally, there is no bruise. If we don't put it on, he has an inflamed bruise for days. A friend used Extinguish on her son when he had a skateboarding accident, and a nasty scar had begun to form on his face. It healed very nicely and helped remove the scar tissue quickly. I highly recommend giving this oil a try!